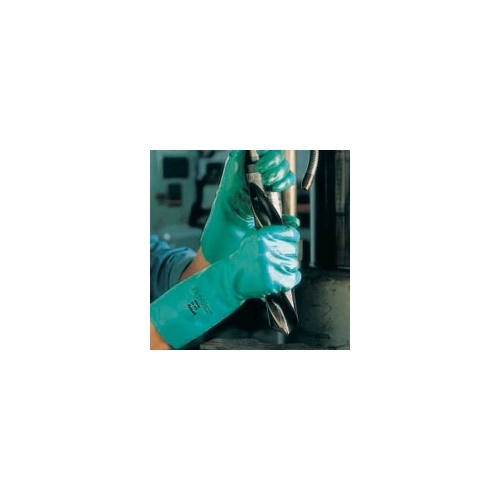 Ansell Sol-Vex 13", 22 Mil, Nitrile GlovesChemically case-hardened for extra chemical and abrasion resistance. Textured finish provides a sure grip, wet or dry. Contoured palm and curved finger design reduce hand fatigue. Unlined for better conformity than lined gloves. Outstanding chemical resistance outperform--natural rubber and neoprene.Tough nitrile gloves guard against abrasion, cuts, snags, and punctures.Curved finger design increases comfortResists most solvents for use in many applications Features an embossed finish for easier wet handling Contoured palm adds comfort Ergonomic design and wing thumb reduce hand fatigue Textured finish provides excellent grip Compliance: Made with FDA-accepted materials. Great for automotive assembly, refining, chemical handling and processing, degreasing, and maintenance.